Conor McLennan joined Cleveland State University as an assistant professor in the Psychology department just three years after receiving his Ph.D. from the University at Buffalo. He spent that time at the University at Buffalo in a postdoctoral position to gain further research experience. His background in research allows him to teach such classes as Behavioral Science Statistics and Memory and Cognition. While planning for his CSU teaching career, McLennan considered that some students in his Behavioral Science Statistics course would be hesitant to participate due to the intimidating nature of statistics. Instead of lecturing to a silent classroom, he wanted to engage his class and confirm their comprehension of the course material. Based on the recommendation of a fellow professor, McLennan thought that the TurningPoint student response system would be a welcome addition to his classes to increase participation and gauge understanding. McLennan used TurningPoint slides to review information and instantly assess class comprehension with student response clickers. Particularly in a class like statistics, he found that it was sometimes difficult to tell whether or not the students were able to grasp concepts and processes. Inserting a few interactive student polling questions allowed him to determine if everyone was on the same page or if he needed to review the material again. He gradually inserted slides throughout the presentation to allow the students to evaluate their own understanding prior to tests. At the end of the semester, McLennan issued an anonymous survey to determine how students felt about student response systems, how useful the clickers were and if class was enhanced with the SRS technology’s use. Although he anticipated positive results from what the students had conveyed to him, he received extremely positive findings, eliminating any doubts about the benefits and value of student response in his classroom. In light of the survey results, McLennan decided that TurningPoint student polling could benefit other psychology courses, and later implemented it into his Memory and Cognition course. He discovered during this class that not only did the student response system facilitate in-class participation and assessment, but grades also noticeably increased. During a spring session of this course, the mean final percentage grade was significantly higher than the fall session without the use of TurningPoint, 85% to 78% respectively. Individual exam grades within the spring class also improved. Before the use of TurningPoint, the mean percentage of exams was at 70%, while the exam grades increased to 80% with the use of the student response system. 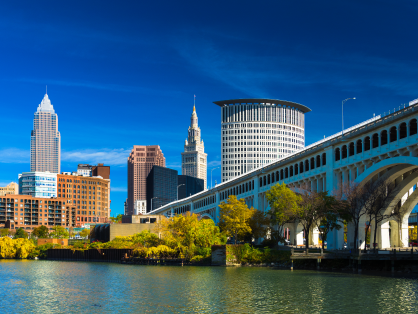 TurningPoint is now the standard recommended student clicker solution for Cleveland State University, thanks to an official standardization endorsement by the university.